Epson announced today that 45 of its projector display products, that are designed to meet the needs of the educational and corporate sectors, have been certified according to the global, third-party sustainability certification TCO Certified. It is administered by TCO Development, that is owned by a non-profit organisation based in Sweden. To be certified, products must meet life cycle criteria for social and environmental sustainability throughout the product life cycle: manufacturing, use and end-of-life. Criteria cover areas such as factory working conditions, reduction of hazardous substances, along with high image quality, energy efficiency during use and responsible end-of-life handling. Compliance with all criteria is independently verified, both before and after the certification process. This means that buyers can feel confident that the products they buy live up to all criteria throughout their usable life. Epson is the global market leader for projectors and has been for the last 16 years. All core technologies built into the projectors, including LCD panels and lamps, are designed and manufactured by Epson, which enables them to ensure every component part is produced to the highest standards of social, environmental and corporate responsibility. Niclas Rydell, director of TCO Certified, comments: “Our goal is to constantly drive the electronics industry to develop more sustainable products. 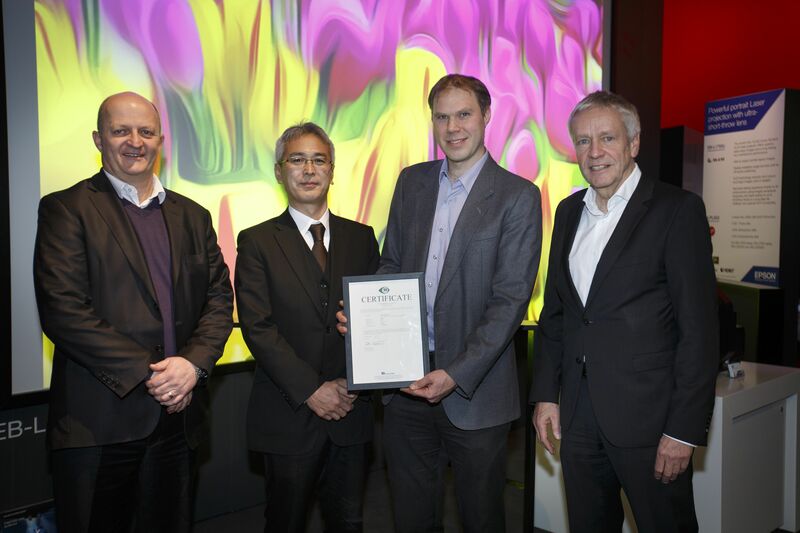 With purchasing directives – such as those in the EU – now calling for greater emphasis on sustainability, projector buyers can use TCO Certified as a tool to help meet environmental and social goals, while not compromising the image performance they demand. 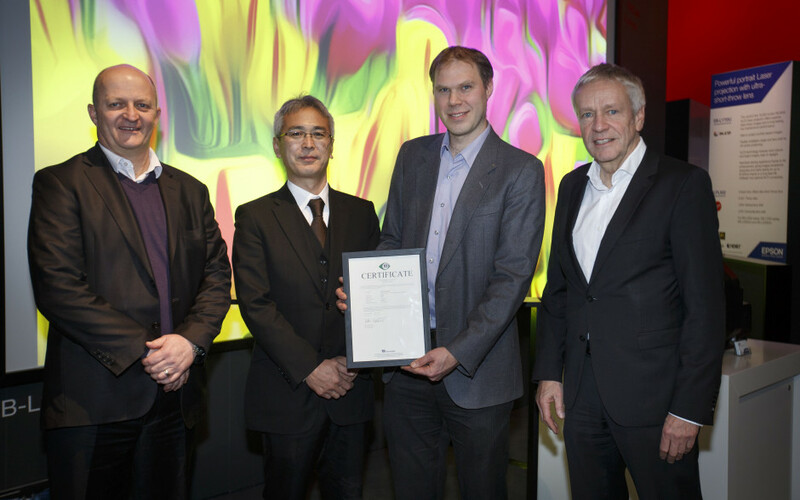 “We are delighted that our projector display products are now designated with TCO Certified,” commented Henning Ohlsson, director of Corporate Social Responsibility at Epson. “Epson’s commitment to achieving the highest quality standards for its products means we manage much of our manufacturing in-house, making it easier to control working practices across the whole manufacturing cycle, from production to delivery. Added to this, we strive to design compact, energy-efficient products that minimise impact on the environment without diminishing performance. Epson display products have been designed to reduce a business’s environmental footprint and minimise power consumption both when projecting images and when idle. The technology includes an energy-efficient basic design and power-saving options on the ECO menu and, when the projector is idle, the Ultra-Low Brightness mode reduces power consumption when the unit is not projecting. When projecting, the newly developed Light Optimiser function automatically adjusts lamp brightness based on the projected image. Power consumption is reduced by as much as 27% when projecting dark images and all Epson projectors are equipped with ECO mode which is designed to extend the life of the lamp and reduce power consumption by over a quarter during projection. Electronics is widely recognised as a risk category for human rights violations during manufacture, which is almost impossible for buyers to assess themselves. Long used by IT purchasers for computer equipment, TCO Certified is an essential means for AV buyers to verify that the projectors they buy are manufactured under fair conditions. By specifying TCO Certified in purchasing contracts, they can also directly influence industry to improve their social and environmental responsibility track records. Epson manages its manufacturing processes in-house, making it easier to control working practices and promote high standards of social responsibility in the manufacturing process. Epson suppliers must also abide by the strict criteria of Epson’s ‘Code of Conduct’ and are checked on a regular basis and any necessary improvements must be implemented immediately. Epson adheres to and exceeds standards established by the International Labour Organization (ILO) 1, including prohibiting the use of child labour and ensuring a minimum employment age. Epson exceeds ILO standards by insisting on a minimum working age of eighteen years old (the ILO benchmark is sixteen) in all its factories and ensures that every employee has a contract with regulated working hours including overtime opportunities. Epson also pays well above average wages. TCO Certified is a global sustainability certification for IT products, founded over 25 years ago. Criteria include socially responsible manufacturing, environment, user health, safety and ergonomic design. All criteria are developed from a life cycle perspective, covering manufacturing, use and end of life phases. Certified product models and their manufacturing facilities are independently verified for compliance. The certification covers eight product categories: displays, notebooks, tablets, smartphones, desktops, all-in-one PCs, projectors and headsets. TCO Certified is a Type 1 Ecolabel in accordance with ISO 14024 . 1. The ILO was established in 1919 and has since worked with governments, employers and employee representatives from 187 member states to establish agreed labour standards and develop programmes to promote humane working standards for men and women. The ILO has developed eight fundamental conventions that companies should adhere to. As well as prohibiting the use of child labour – with a minimum employment age of 16 – these conventions also focus heavily on the free organisation of staff and equal pay.